Another day another startup from Amman, Jordan. But this one is not related to Oasis500 not that I have anything against them but it seems lately that all startups I meet from Amman are incubated at Oasis500. 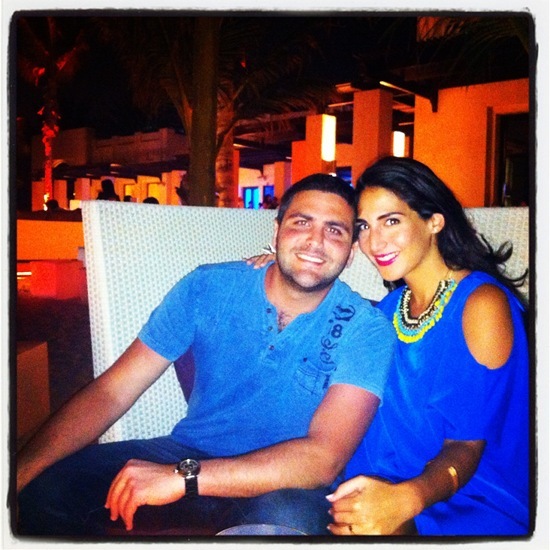 A couple of days ago I sat down with Zeid Malas and Tala Sukhun who are the founder and managing partner at Ihdeeny.com. They also happen to be husband and wife. Together with a third partner Tamara Haj Hasan they launched the online gift registry website on April fifth of this year. ihdeenyis the Middle East’s first online gift registry service, it is a platform that allows users to create and access a wide range of gift items to choose from. An interesting point about ihdeeny is that its not focused on weddings only, but users have the chance to create personal registries for all types of gift-giving and receiving occasions, birthdays, anniversaries, graduations, house warming’s and any other celebration. According to the couple, they have been receiving good feedback about website and so far its working well. “We’re like brokers, we don’t have to stock our own products and it works well for users because the shopping process is done online without the hassle, users also pay the same prices they would at the stores” Said Tala. I wanted to know more about the payment process, because its a big subject nowadays online. Accepting payment online can be a tricky issue, people who went through it know how difficult it is in the MENA region. Currently the team is six people strong between business development, HR and marketing people although the technical work is outsourced, they are planning to moving it in house which makes sense especially since they’re an online business. Since we’re talking about the team I have to mention that I don’t think I’ve ever met someone with such a diverse background such as Zeid’s. At first he said he’s done it all, and in my mind I was thinking I’ve heard that before, but then he started to count the things he was involved in “I tried catering, I had a Shishaagency, worked in the steel and wood industry, worked in trading building materials with the family business, and also did some banking” said Zeid, in all honesty he mentioned more but I couldn’t get myself to stop wondering what on earth a Shisha agency was? But he explained that for a period of time he was importing/exporting high end shisha tobacco! Kind of a shisha drug dealer! Tala on the other hand comes from a finance background and before ihdeeny she decided to change her career and work as an event coordinator at a school in Jordan. Ihdeeny is a completely free platform for all users, they generate revenue by taking a commission of every sale made from the vendors. So if nobody purchases anything they don’t make any money! But what’s in it for the vendors? Well, they get an online presence for free (or at a very low cost which is the commission) “We’re essentially marketing their products and sending traffic their way.” said Tala. In the future they’re also planing on adding spots for featured vendors on the website at an agreed rate, however for now they’re doing it for free. All vendors are either selected or approved onto the website, during our meeting Zeid received a confirmation from a vendor agreeing to sell her items on the website. And according to the founder a lot the vendors are contacting them to sell their items through ihdeeny. Which I found to be surprising, I thought that they might face some resistance in Jordan from vendors to list their items, but apparently not. 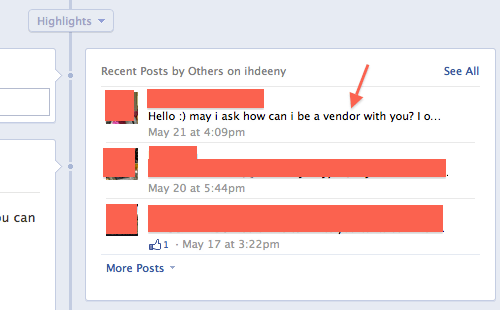 Below is a screenshot from ihdeeny’s facebook page with a request from a vendor to sell on the website. At the moment they have around 15 vendors but they’re forecasting to have 25+ vendors by the end of next week all of whom are from Jordan. For the moment they are focusing on the registry feature since the summer “wedding season” is approaching, so they are working closely with wedding planners, independent designers and related vendors who don’t necessarily have any physical shops. Since April ihdeeny has managed to get around 4500 unique visitors and 32K pageviews with minimal advertising spend. Which includes Facebook ads, a radio campaign on local stations, and magazine ads. Cashback: This is a feature only for weddings, for example if you don’t want to buy a gift, or would like to also give away some money on top of the gift, you can pay with your credit card and the receiving couple can withdraw it in cash or vouchers from ihdeeny. And above all you don’t need to create an account to make a purchase! I asked the couple what advice they have to offer other people starting up in the region and they said that it took a lot of patience, dedication and attention to details. As for the future the team are currently working on expanding regionally into the UAE, Qatar, Kuwait and other countries in the MENA, and expect the concept of gift giving to shift in the direction of online gift giving, since its an effective and efficient way to give gifts. As we were wrapping up our meeting, Zeid liked to bring up a very important point which was the name, I hadn’t asked because I knew what it meant (ihdeeny loosely translated means gift giving in Arabic) and they are looking to own the keywords gifting and gift giving online. But Tala then jumped in and said “He’s only bringing it up now because he came up with it and he’s very proud of it!”. And from what I picked up he was quite adamant about the name too… Apparently he gave the team an ultimatum either proceeding with ihdeeny or no project at all! That a boy Zeid! If you’d like to know more about ihdeeny checkout and like their facebook page. Finally I’d like to thank the team for taking the time to meet with me and wish them the best of luck with their future plans. What do you think? Do you like what ihdeeny is doing? Would you use such a website? Let us know your thoughts or signup to receive the latest startup news from the MENA in your inbox.